Genevieve Williamson’s 16″ Buoyline necklace is part of retailer Anthropologie’s new arrivals in their spring online exclusives. You can witness Genevieve building her inventory on Instagram and her blog. Her husband and mother packaged and bar-coded to meet the deadline. Stay tuned as Genevieve reveals what she learned about wholesaling, about business and about herself from this big venture. You can also shop for Genevieve’s works on Etsy. I smile when I remember that she’s one of the featured artists in my book, Polymer Clay Global Perspectives. Today we announce the launch the anticipated Volume II – RETRO that so many of you have been waiting for! We are over the moon about this collection of Cynthia Tinapple’s newest extruder disk set which contains 8 fun and fashionable patterns. Cynthia doesn’t like to brag about herself so KazuriWest has taken over the controls today. Check out the photo above of some of the amazing designs you can make and watch this quick video (below) of the disks in action. We here at kazuriwest.com are excited to launch Volume II – RETRO. Cynthia is an international award-winning designer, educator, author of the book Polymer Clay Global Perspectives and producer of this renowned and insightful blog. As many of you know, she is quite a talented and amazing artist and loads of fun to work with. Cynthia originally produced Volume I of her polymer clay extruder disks to meet the need for more clay pattern options and it flew off the shelves with customers all over the world clamoring for more. We cannot believe how popular extruders are becoming. Her designer’s eye has found fashionable icons and translated them into extrudable patterns that you can easily integrate into your work. Order yours here. There’s nothing like reading about snowy Vermont to get you primed for the season–unless it’s an article about Celie Fago in snowy Vermont. The online issue of Woodstock Magazine is free. 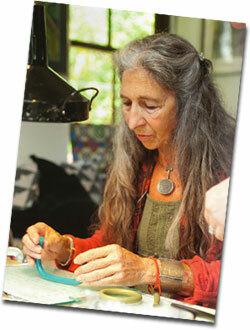 Flip to page 54 and you’ll see Celie in her studio teaching a class how to make one of her polymer bangles that’s loaded with rings of stone and beaded wires. 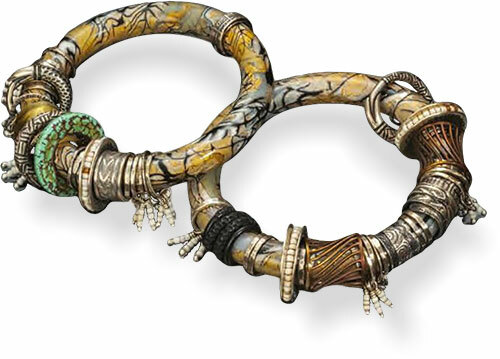 The bracelet jangles with a collection of circles made from precious metal clays. Celie mixes her media and I cheer when I find polymer holding its own in her rich melange of metals, beads and found objects. Browse her Etsy store, her blog and her Facebook page. I need your vote! Every Fall, Crafthaus awards a micro project grant and my application is in the running. Prison Polymer: Art as a Lifeline Back to the Community is a project I’d like to nudge forward. This summer Leslie Blackford and Tammy Dye taught one class in Ohio prisons, Maggie Maggio and I taught another. We were all surprised and fascinated by the impact that our medium had on inmates. What could we do with polymer in prisons that would make a difference? How could our community help? That’s what I’ll use the grant to discover. Please vote for Project #2. Thank you for your help. 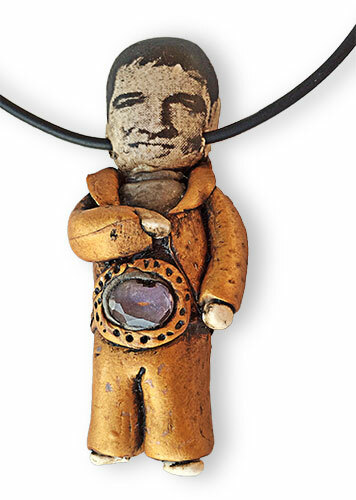 It’s hard to look at Leslie Blackford’s Elvis and not smile at his gold leisure suit and sparkling belt buckle. Here are the characters from one afternoon’s class. You can follow her on Facebook too. Would you like to have a memento from the ground-breaking Carthage College Re-Visioning exhibit? 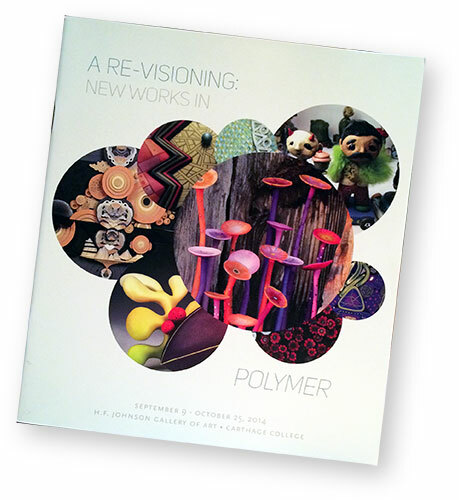 In the show catalog Rachel Carren writes eloquently about how polymer art is expanding and reinventing itself. This slim full color publication would make an elegant addition to your bookshelf. All you have to do to enter is leave a comment below. I’ll pick five lucky winners on Monday. 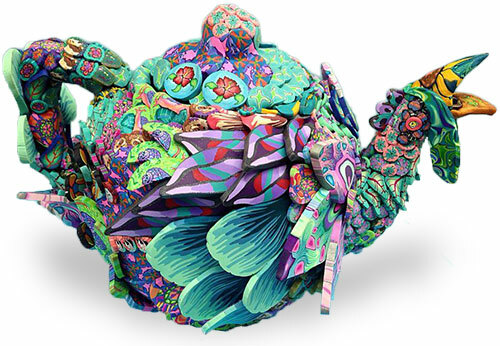 You may see a teapot where Layl McDill sees a fanciful chicken. It flew out of her studio as soon as it was finished. Layl layers slices from her brightly patterned canes onto vases, pitchers, teapots and more. She piles on the color (see the in-process shot below), hoping to catch the viewer’s eye and inspire wonder. In this issue of The Polymer Arts, Layl is one of four featured artists who approach polymer with whimsey and humor. Layl adds to her site regularly and puts her most recent work on her Facebook page. The overlapping circles on this pin and pendant by Spain’s Ana Belchi are a mystery, a color illusion which she teaches in a workshop that you can read about here. Ana will be teaching composition at EuroSynergy where I’m hoping to see her illusions with my own eyes. She offers some helpful color wheels and shape templates as free downloads on her site.